I ordered these as a Mother's Day Favor at our champagne breakfast for my assisted living residents. We are so pleased and looking forward to presenting them. Very well made and good for kids events. Not for adult too little. Overall lovely. I was pleasantly surprised with my purchase. They are super cute and of a good quality for the price! Beautiful!! I’m super satisfied with my purchase. Will recommend it to anyone. Thank you for your excellent service. I ordered 60 of these compacts for a 50th anniversary celebration of our Debutantes Assembly Committee and everyone loved them! They were so pretty and great quality for the price! I would recommend this product to anyone! Very happy! I got these as a thank you gift for my daughter in law to give to her bridesmaids - She love it. Oh my goodness!! I LOVE these mirrors. I bought these as handouts for teen girls and they love them so much!! Thank you Thank you Thank you so much for having these in stock!! I fall in love with this beautiful piece for my mother’s 70 party to give out as a souvenir, when I saw it on the website so I ordered them. 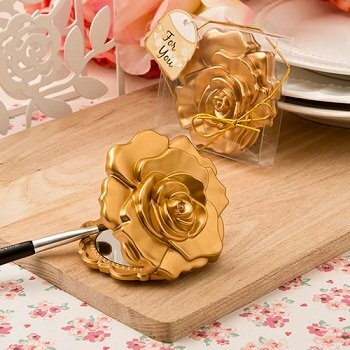 I received them already and I cannot be more satisfied with my choice..... this item is simply PERFECT for the occasion.... it is classy, beautiful,neat quality...just perfect. Very very happy with my order, and delivery was fast! Thanks everyone at nicepricefavor for such an amazing work!! I highly recommend this site and their products and price! Super reliable!!! I am very pleased with the product. Looks even better than I expected. Very affordable. This are beautiful made. I can't wait to add them on our daughter sweet 15th celebration. They go so perfect with the theme we choose of the Beauty and the Beast. Just what I wanted. It’s perfect for my daughter's Quinceañera.